Los Altos UMC has from the start been a church where high standards of music in worship have been expected and upheld. Our full choir program has attracted singers and ringers of all ages and has brought many appreciators of good music into our congregation through the years. Topper Smith was a tenor soloist working in the Long Beach area. The church music program began with an adult choir. A youth choir was started by Frank Allen, a choral music teacher in the Long Beach Unified School District and by then the Director of Music at LAUMC. Frank was also a fine tenor soloist. A children’s choir was started by Myrtle Belle Dunlap, an elementary music teacher in LBUSD. Mary Breuer saw a job notice on the bulletin board in the music department at CSULB and was hired for the position of Junior Choir Director at LAUMC. After working with this upper elementary group, a second lower elementary choir, the Cherub Choir was started. Each of these groups had 60+ singers, rehearsed on Wednesday afternoons and sang in church once monthly. In the first 20 years, LAUMC had an electronic organ. It wasn’t until the late 1970s that the church had the leadership and the financial support to find and purchase the fine instrument which graces our sanctuary today. In 1960, Frank Allen turned over the Youth Choir to Mary Breuer. This was a group of 30+ singers who sang in 4 part harmony and was responsible for the 8:30 service weekly. John Ranney was a recent graduate of CSULB and an outstanding pianist. He graced our services for 20 years before moving to northern California. Lindy Collins was then the choral teacher at Long Beach Poly High School. He led our adult choir program for 2 years. Mr. Collins was followed by Frank Pooler, the outstanding director of Choral Studies at CSULB. Frank brought some of his college singers in to augment our forces. Much of our fine music library can be attributed to his purchases during his tenure here. It was during this time that the CSULB Winterfest was held in our sanctuary. The first evening concerts planned by our church took place in the 1960s. One such program in 1963 featured duo pianists, Betty Allen and Virginia Mountney (a CSULB professor), and Frank Allen, tenor and Mary Breuer, soprano. Alan Caddick was a choral music teacher in LBUSD. Ed Thompson was on the choral music staff at CSULB. Under his fine leadership the first presentation of Amahl and the Night Visitors was given in our sanctuary to a packed house in 1976. Debbie Spielberg played Amahl; Mary Breuer, the mother; and Sam Kosowsky and Milt Sager, 2 of the 3 kings. In 1975 the Senior High and Young Adult Choir presented The Creation by Bobrowitz & Porter under the direction of Ed Thompson. The Fine Arts Committee was started in 1977 with Phyllis Poper as its first chairperson. In the mid 1970s, a project to find and secure a pipe organ for our sanctuary was begun under the chairmanship of Jon Martin, a member of the Adult Choir and the Finance Committee. Manuel Rosales, an organ builder in Los Angeles, was retained to help find an instrument. The William B.D. Simmons organ was found by Mr. Rosales in the Howard Street Presbyterian Church in San Francisco. This church was scheduled for demolition, and the organ was purchased and moved in thousands of pieces to the shop of Mr. Rosales for restoration. Several tenor-clef stops were enhanced with bass octaves. The original 13 Subbass pipes were augmented to 30, and a 7-stop Pedal chest was prepared. On Sept. 24, 1978, the Dedication Concert for our “new” pipe organ was presented by John Ranney. At this event, the significance of this organ, thought to be the oldest pipe organ west of the Mississippi, was recognized by the City of Long Beach and the Organ Historical Society. The William B.D. Simmons Organ, 1852, is a registered landmark with the City of Long Beach, and “has been selected for citation as an instrument of exceptional historic merit worthy of preservation” by the Organ Historical Society. For more information about the Organ click here. In the late 1970s, the first three octaves of handbells was purchased for LAUMC through memorial funds in the name of Sybil Royer. The first Handbell Choir Director was Jane Dennis. As the years progressed, the fourth octave of bells was purchased with Pearl Sager Memorial Funds and gifts from the Bell Choir. The fifth octave was added much later with a gift from Mildred Wadleigh. Mary Bush provided the Bell Choir with the first two octaves of handchimes, and the choir was able to purchase three more octaves through fund raising. In the 1970s an annual Children’s Choirs musical was begun. There are many highlights in the LAUMC music program in the 1980s. In 1980, a concert “Go Out with Joy” was presented by the Adult and Youth Choirs under the direction of Marc Clemens and Mary Breuer. In 1981 our marvelous Sanctuary piano was given to the church by Robert and Virginia Avery. John Ranney and Jon Martin were both influential in obtaining the 1905 Concert Grand Steinway Piano, Model C. A dedication concert was given on Feb. 22 by John Ranney. Jan. 17, 1982, the Youth Choir, under the direction of Mary Breuer, presented the musical, The Witness, with youth members providing instrumental accompaniment, solos, and choir. December, 1982, Marc Clemens and the Adult Choir presented The Hanging of the Greens. Feb. 6, 1983, a Brahms chamber music concert was given featuring a solo quartet of Mary Breuer, Billie Southern, Frank Allen, and Marc Clemens. June 29, 1983, our outstanding Director of Music and bass soloist extraordinaire, Marc Clemens, gave a recital of Spirituals. March 6, 1984, the Adult Choir presented Peaceable Kingdom by Randall Thompson. In December, 1987 Marc Clemens directed his last big concert before his passings. The Christmas portion of Handel’s Messiah was presented. In the summer of 1988, the Adult Choir, under the direction of Mary Breuer and the Handbell Choir presented a well-received Pops Concert. In 1988, the Sanctuary Choir began its annual Fall Retreat which for many years was held at the Breuer’s mountain cabin in Arrowbear. The Fauré Requiem was presented by the Sanctuary Choir. One of the biggest events, which established a choir tradition, was the first concert tour to Europe. Under the direction of Mary Breuer, music; and Jan Kussler, travel agent and soprano in our choir; with John Ranney returning as our tour accompanist; the Sanctuary Choir set out for a five concert tour to Germany, Austria, and Switzerland. Highlights of the 1990 Concert Series: an organ concert given by our new organist, Derek Gordon; a CSULB Chamber Music Concert; another LAUMC Pops Concert; and a concert by the Pacific Handbell Ensemble. In March, 1991, The Sanctuary Choir and the Choir of Riviera United Methodist Church presented the Mozart Requiem. In October, Derek Gordon gave an exciting concert of Toccatas for organ. Our December concert was Ye Olde English Christmas. An important event of 1992 was the establishment of the Chancel Choir, a second adult choir whose main responsibility is to provide music for the 8:30 a.m. worship service. That year the concert series featured Derek Gordon in an organ concert, the Aman Folk Ensemble in a concert of folk dance from around the world, the Sanctuary Choir presented the Rutter Requiem, John Ranney presented the Chopin Concerto No. 1, and there was a concert by the Night Blooming Jazzmen. Also in 1992, the Sanctuary Choir embarked on a second tour to Europe, this time going to Holland, Belgium, Luxembourg and Paris. Concerts were given in each of these places. A highlight of the tour was singing in the St. Laurenskerk in Alkmaar, Holland , the home church of the Holland Men and Boys Choir hosted previously by some of our church families. This church has one of the finest organs in Europe, which was played by Derek Gordon during our concert there. In 1993, a project was funded to complete the Pedal division of our organ and revoice it for our sanctuary necessitated by the installation of seat cushions. On April 25, 1993, Derek Gordon gave a marvelous concert to re-dedicate the completed instrument featuring the Poulenc Concerto for Organ and Orchestra in Sol Mineur. 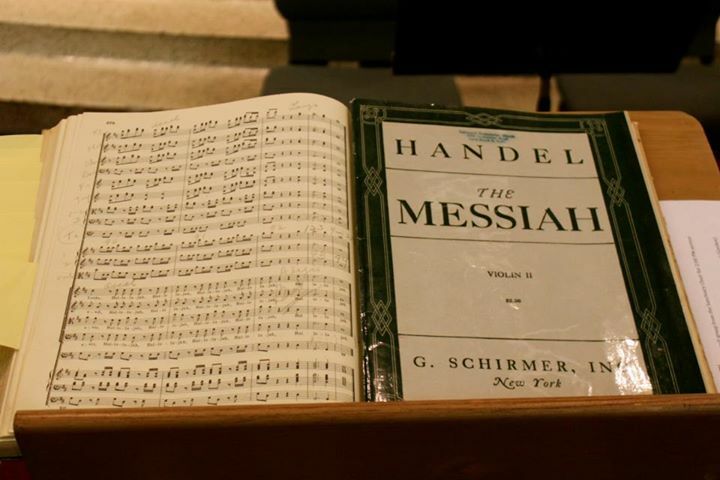 In December, the Sanctuary Choir presented Handel’s Messiah with the L.A. Baroque Orchestra. In 1994 our church received a grant from the Long Beach Public Corporation for the Arts. Subsequently, that year the Arts Series featured a calendar of varied ethnicity. A Korean Choir performed, a Cambodian group, and the Spirit Chorale of Los Angeles. In addition, Derek Gordon presented a Bach concert, and the choir presented the Brahms Requiem. In 1995, Cherry Rhodes, a well known L.A. organist and associate professor of organ at USC, presented an organ recital, a concert by the Holman UMC Choir was given, and the Night Blooming Jazzmen returned. The summer of 1995 found our Sanctuary Choir again going to Europe this time to England and Wales. The choir performed in the Cathedrals of Salisbury, Winchester and Wells. In 1996, the Sanctuary Choir with the cooperation of Ken McMillan, Senior Pastor, took on a year long project of preparing and presenting Mendelssohn’s Elijah. Sermons and anthems were planned several times during the year to prepare the congregation, and then the full presentation was given in the Spring with Marvin Finnley singing the role of Elijah. During an extended intermission, a box meal was provided for the performers and audience by United Methodist Women. Also in 1996, Derek Gordon and the Sanctuary Choir made a compact disc, Sunday Masterworks. Derek organized the music into three sections; Christmas, Passion/Easter, and Festival Music. Each section offered Prelude, Offertory, Anthem, and Postlude. Highlights of the 1997 Arts Series were the March presentation of the Durufle Requiem, and the Christmas presentation of the Respighi Laud to the Nativity. In 1998 the California Children’s Chorus presented an outstanding concert at LAUMC. The Sanctuary Choir repeated the Rutter Requiem. Also featured, as a part of the Arts Series, was Violins, a series of bronze sculptures by Dr. Howard Hitchcock, long time member of our Sanctuary Choir and Professor Emeritus of Art, CSULB. Dr. Hitchcock also began a project which would continue for the next 3 years to paint figures to decorate the sanctuary at Christmas time. This year, he provided us with the Holy Family. The 1999 Arts Series featured the Los Angeles Gay Men’s Chorus, and the Fauré Requiem by our Sanctuary and Chancel Choirs. Also in 1999, Dr. Hitchcock painted the two Angels for our use at Christmas. In June 24-30, 2000, members of the Sanctuary and Chancel Choirs participated in the World Projects International Music Festival in Sydney, Australia. The featured work was Fanshawe’s African Sanctus. Many choir members extended their stay to include trips to New Zealand and the Great Barrier Reef. In 2000, Dr. Hitchcock painted the Shepherds, and in 2001, the 3 Kings. The complete set of Holy Family, Angels, Shepherds and Kings now adorns our sanctuary every Christmas season. In 2001, the adult choirs of LAUMC and Riviera UMC presented Bach’s Passion According to Saint John. A performance was given at each of the two churches. 2002 was a huge year for the music program at LAUMC. The Sesquicentennial Celebration for the Wm. B.D. Simmons Organ, 1852 had been in the planning stages of our Fine Arts Committee for many years. Two very big concerts were given. In March, Derek Gordon and a professional brass ensemble played a concert of music for organ and brass. At this event many involved in the acquisition and restoration of this organ for LAUMC were honored: Manuel Rosales, John Ranney, Jon Martin, George Bozeman (who revoiced the instrument in 1993). Christina Kahler, a member of the Fine Arts Committee and Sanctuary Choir, wrote an illustrated history of the organ entitled, Tracker, My First 150 Years. In September, 2002 a second concert was given with Derek Gordon, Organ, and the Symphony Orchestra of CSULB, Richard Rintoul, Director. This concert featured the Poulenc Concerto for Organ and Orchestra in Sol Mineur, and Saint-Saëns Symphony No. 3 for organ and orchestra. Also in 2002, members of the Sanctuary and Chancel Choirs sang the Fauré Requiem in a massed choir presentation of MidAmerica Productions in Carnegie Hall, New York. This performance was under the direction of esteemed conductor and composer, John Rutter, of England. In 2003 the Sanctuary and Chancel Choirs presented portions of the Brahms’ Requiem at a Good Friday Tenebrae Service. 2004 was a big year for music at LAUMC. A 100 voice choir of current and past choir members assembled to present a mega concert to mark the 50th anniversary of the church. Choir members from all over the country came “home.” In addition to current Director of Music, Mary Breuer, former choir directors returning to conduct portions of the concert included Frank Allen, Frank Pooler and Ed Thompson. The church’s first Director of Music, Topper Smith, was also present. A much revered former director, Marc Clemens, who had died, was honored. 2005 was another banner year as we planned a “piano” concert in recognition of the 100th anniversary of our Steinway Model C grand piano. Derek Gordon played a Mozart Concerto in our sanctuary with the orchestra from CSULB, and Ann Shin, winner of the concerto competition at the university played a Rachmaninoff Concerto. This piano was a gift to the church in the 1970s by Robert and Virginia Avery. The Fine Arts Series has continued to flourish in the 21st Century. We have hosted many fine groups of ringers, singers and instrumentalists over the years. Our Sanctuary Choir has given musical leadership with many of the well known Requiems and Christmas oratorios from the standard repertoire. We have continued to bring in brass choirs for Easter and sometimes for Christmas over the years.